The Cornucopia, or Horn of Plenty, is actually the horn of the goat Amalthea, the nurse of baby Zeus in Greek mythology. Zeus, ruler of the Greek pantheon, had a rough upbringing. His father Cronos knew that a son was destined to depose him, just as he had deposed (and castrated!) his father Ouranos. Cronos, taking no chances, swallowed each of his children when they were born. At last, Cronos’ wife Rhea managed to fool him by wrapping a stone in swaddling clothes in place of her youngest son, Zeus. She then hid the baby away in a cave on Mount Ida in Crete. But how to raise the baby without Cronos discovering him? Rhea dared not spend all her time with Zeus. Therefore, one of her attendant nymphs gave her Amalthea, a magical goat (can you tell this is an old, old story? ), to nurse the divine child. When Zeus grew up, he defeated Cronos and free his divine brothers and sisters from his father’s stomach. They became the gods of Olympus. When Amalthea the goat died (or, in some myths, when he sacrificed her), Zeus used her hide to create the protective aigis, the magical goat-skin worn by Athena as armor, and placed her in the sky as the star Capella (Latin for “little goat”). How Amalthea’s horn came to be associated with an overflowing horn of plenty — or how it became detached from the goat — is not quite clear in classical Greek mythology, although it is a common motif in Greek art. (Above, the earth-god Plotous holds the keras amaltheias, horn of Amalthea, facing Demeter holding a scythe for harvesting grain). Roman author Ovid explains that the horn broke from the goat while she was nursing Zeus, and Amalthea (here a nymph who owned the goat, rather than the goat itself) wrapped the horn in a wreath and filled it with fruit to feed the infant god. This sound to me like a late attempt to explain a mythological symbol whose origins are so old they are forgotten. One thing is clear: the horn of Amalthea overflowing with fruits, honey, and grain is an extremely ancient symbol of the harvest, known to the Greeks 2000 years before the cornucopia became the symbol of American Thanksgiving. 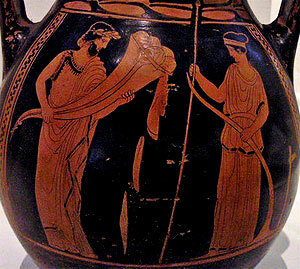 For translations of several ancient Greek and Roman writers on the Horn of Plenty, see theoi.com’s entry on Amalthea. Keras amaltheias is the ancient Greek term for the Horn of Plenty: “Horn of Amalthea.” Cornu copia is Latin for “Horn of Plenty,” the word used by Roman authors like Ovid for the same mythological symbol.